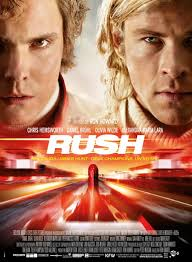 Rush is a based on real events story directed by Ron Howard and scripted by frequent Ron Howard collaborator Peter Morgan. The film attempts to explore the infamous rivalry between two Formula One racers during the seventies. As a period piece it is composed rather well with costumes and set pieces consistent with the time, but not as flashy and obvious as, say the upcoming American Hustle. This may have been a deliberate choice, perhaps in order to not distract the audience from the story. Unfortunately, the story lacked balls and could have done with some style and a little more TLC from Howard. I say balls, rather than boldness, guts, tenacity, or fearlessness, because that is the way I think the characters in the movie would express it. For all the mandatory rhetoric about passion and heart that you are bound to find in a racing movie, I found none of that in the composition. Whenever a driving sequence got on the verge of becoming a thrill it was cut short. It is also uneven with most of the longer race scenes weighing down the end of the film with very little payoff. One of the flaws of the film is that by attempting to shed light on Hunt and Laude (both characters involved in the rivalry) they fail to give the audience someone to root for. The point is not the rivalry or who wins, the point is that they push each other to be better. It’s an interesting idea, but its not a movie and it failed to arouse true interest as the stakes supposedly mounted, because I had no investment in one character over the other. It was so passive, and thusly, boring. It might have been a good character study if more attention were paid to dialogue and creating scenes that we could dwell in and enjoy without feeling the need to trudge forward, but trudge it does, from one uninspired scene on to the next, creating a sense of impatience for it to all be over. Despite the noble attempt to not chose sides, or rather to expose the virtue of both sides beneath the surface, and the desire of the producers to stick to the actual events that inspired the film; I think the fair and balanced approach was a failure. If Rudy hadn’t made the new Notre Dame coach the villain in the third act, the whole spirit of the story would have suffered. In the end, these two very different, but very driven racers had nothing to fight for but to beat each other. The events of the past are little more than a blip in history that most people won’t even recognize and this movie will do little to change that fact. It too will soon be forgotten. Renny Harlin captured the pulse pounding action of Indy racing much better in the Stallone film Driven twelve years ago. I recommend that for good racing action, or even Cars, or The Dukes of Hazard. As a sports movie with a historical context it may be of interest to some people, but I believe it fails as an adaptation to be a fully developed story and the direction is not what I expected from Ron Howard.